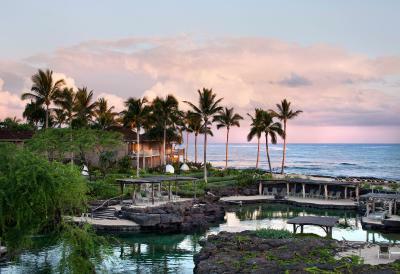 Lock in a great price for Four Seasons Resort Hualalai – rated 8.9 by recent guests! Restaurants were very good. The resort was peaceful and nice. The whole experience was exceptional! The staff were extra helpful and all the facilities were awesome! 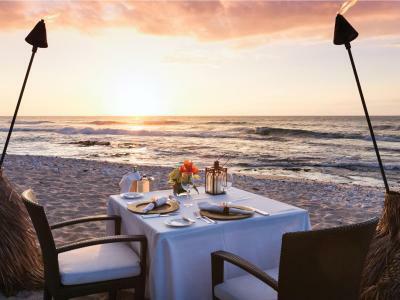 Food are also delicious while the sunset at the beach is one of the best I've ever seen! Excellent food, very comfortable bed, amazing landscaping and breath taking views. It was heaven. 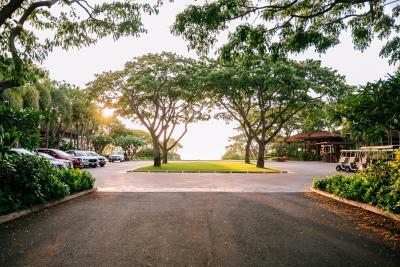 The room was amazing, the restaurants were fabulous with beautiful views, the golf course was impeccably manicured, and the people who work at the hotel were so friendly and helpful. Also, Austin made it possible for my husband and I to stay in the room until 3pm because our flight was at 5:30pm. We are so appreciative. Wonderful sunsets. Gorgeous gardens and landscaping. Beautiful walks/runs/jogging tracks. Like the little touches like sunscreen and leave in hair conditioner at the pool area. Lovely spa. Ulu restaurant is one of the best gastronomic experiences I've ever had. Klassisches Haute-Volé Hotel... man wird auf Händen getragen, jeder weiss wie man heisst... fast zu viel des guten. Essen war lecker... Man kann diverse Aktivitäten buchen, alles gesalzen teuer. Frühstücksbuffet pro Person 45 Dollar ohne steuer. Abendessen à la carte abends zu zweit unter 150 dollar unmöglich. Typisches amy- "pseudowichtig" Golfhotel. Guter Kinderhort, wenn mal die Eltern zeit für sich haben wollen. Sehr grosse extrem schön gepflegte Hotelanlage, in der niemand verloren geht. Tolles Hotel, gutes Essen, professioneller Service. Zimmer und Golfplatz in sehr gutem Zustand. Vermutlich im Gesamtpaket mit das beste Hotel der Insel. 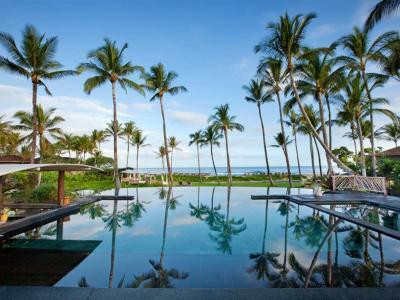 Four Seasons Resort Hualalai This rating is a reflection of how the property compares to the industry standard when it comes to price, facilities and services available. It's based on a self-evaluation by the property. Use this rating to help choose your stay! 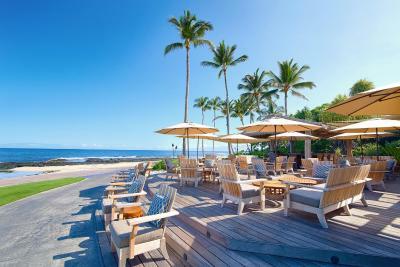 Located along the Kona-Kohala coast of Hawaii Island, the Four Seasons Resort Hualalai features even swimming areas, five dining options, and ocean views. 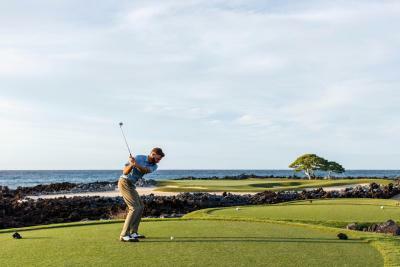 An 18-hole Jack Nicklaus signature Hualalai Golf Course is on site. Rooms offer a flat-screen TV. 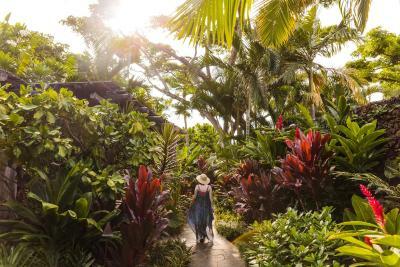 The modern rooms at the Four Seasons Resort Hualalai at Historic Ka’upelehu offer Hawaiian-inspired décor with views of the resort grounds or the Pacific Ocean. Free toiletries and a work desk are also included. 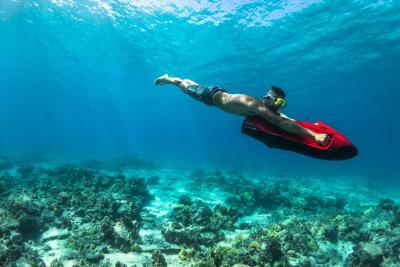 Guests can enjoy a saltwater pool and an adult only area, as well as a full spa, and 15,000 square feet of fitness facilities. Private, white sand beaches are available at the Four Seasons Resort Haulalai with calm waters for easy swimming. Three restaurants and 2 lounges are available on site. Beach Tree offers beachside Italian and Mediterranean cuisine. 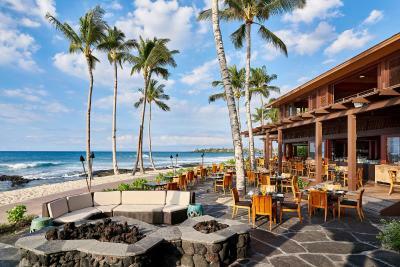 Guests can enjoy the food and ambiance of a steakhouse with Hualalai Grille, located above the 18 hole golf course. 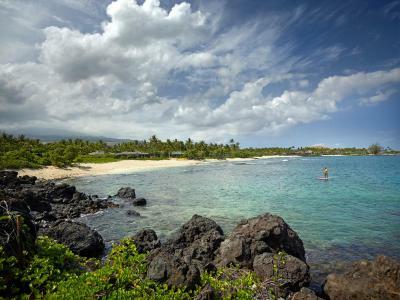 Hapuna Beach is 30 minutes’ drive from the resort. Akaka Falls State Park is 2 hours’ drive away. Hawai’i Volcanoes National Park is 2 hours’ drive from the property. This property also has one of the top-rated locations in Kaupulehu! Guests are happier about it compared to other properties in the area. This property is also rated for the best value in Kaupulehu! Guests are getting more for their money when compared to other properties in this city. When would you like to stay at Four Seasons Resort Hualalai? Located on the lower levels of the bungalows with views of the gardens and pool, this room features a flat-screen TV, a DVD player with a lending library at the Concierge desk, an alarm clock radio, a coffee machine, filtered water, an in-room safe, daily housekeeping service, a washing machine and tumble dryer, a beach tote, and an private bathroom with bathrobes, a hairdryer, and free toiletries. Located on the lower level of the bungalows with partial ocean views, this room features a flat-screen TV, a DVD player with a lending library at the Concierge desk, an alarm clock radio, a coffee machine, filtered water, an in-room safe, daily housekeeping service, a washing machine and tumble dryer, a beach tote, and an private bathroom with bathrobes, a hairdryer, and free toiletries. Located on the lower level of the bungalows with partial ocean views of the ocean, this room features a flat-screen TV, a DVD player with a lending library at the Concierge desk, an alarm clock radio, a coffee machine, filtered water, an in-room safe, daily housekeeping service, a washing machine and tumble dryer, a beach tote, and an private bathroom with bathrobes, a hairdryer, and free toiletries. Featuring ocean views, this room features a flat-screen TV, a DVD player with a lending library at the Concierge desk, an alarm clock radio, a coffee machine, filtered water, an in-room safe, daily housekeeping service, a washing machine and tumble dryer, a beach tote, and an private bathroom with bathrobes, a hairdryer, and free toiletries. 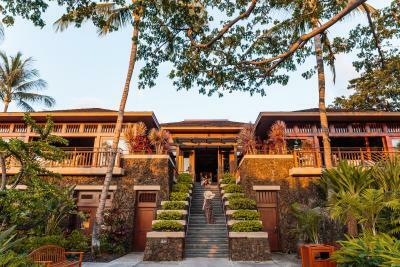 Located on the upper floors of the bungalows with ocean views, this room features a flat-screen TV, a DVD player with a lending library at the Concierge desk, an alarm clock radio, a coffee machine, filtered water, an in-room safe, daily housekeeping service, a washing machine and tumble dryer, a beach tote, and an private bathroom with bathrobes, a hairdryer, and free toiletries. Featuring panoramic ocean views, this room features a flat-screen TV, a DVD player with a lending library at the Concierge desk, an alarm clock radio, a coffee machine, filtered water, an in-room safe, daily housekeeping service, a washing machine and tumble dryer, a beach tote, and an private bathroom with bathrobes, a hairdryer, and free toiletries. Featuring pool views, this suite features a flat-screen TV, a DVD player with a lending library at the Concierge desk, an alarm clock radio, a coffee machine, filtered water, an in-room safe, daily housekeeping service, a washing machine and tumble dryer, a beach tote, and an private bathroom with bathrobes, a hairdryer, and free toiletries. Featuring ocean, garden, and pool views, this suite features a flat-screen TV, a DVD player with a lending library at the Concierge desk, an alarm clock radio, a coffee machine, filtered water, an in-room safe, daily housekeeping service, a washing machine and tumble dryer, a beach tote, and an private bathroom with bathrobes, a hairdryer, and free toiletries. Featuring ocean views, this suite features a flat-screen TV, a DVD player with a lending library at the Concierge desk, a separate seating area, an alarm clock radio, a coffee machine, filtered water, an in-room safe, daily housekeeping service, a washing machine and tumble dryer, a beach tote, and an private bathroom with bathrobes, a hairdryer, and free toiletries. Featuring ocean views, this suite is ADA compliant and features a flat-screen TV, a DVD player with a lending library at the Concierge desk, an alarm clock radio, a coffee machine, filtered water, an in-room safe, daily housekeeping service, a washing machine and tumble dryer, a beach tote, and an private bathroom with bathrobes, a hairdryer, and free toiletries. Featuring ocean and golf course views, this suite features a flat-screen TV, a DVD player with a lending library at the Concierge desk, an alarm clock radio, a coffee machine, filtered water, an in-room safe, daily housekeeping service, a washing machine and tumble dryer, a beach tote, and an private bathroom with bathrobes, a hairdryer, and free toiletries. Located on the upper floors with views of the Pacific Ocean and the surrounding gardens, and pools, this suite features a flat-screen TV, a DVD player with a lending library at the Concierge desk, an alarm clock radio, a coffee machine, filtered water, an in-room safe, daily housekeeping service, a washing machine and tumble dryer, a beach tote, and an private bathroom with bathrobes, a hairdryer, and free toiletries. Located on the upper floors with views of the Pacific Ocean and the resort's shoreline, this suite features a flat-screen TV, a DVD player with a lending library at the Concierge desk, an alarm clock radio, a coffee machine, filtered water, an in-room safe, daily housekeeping service, a washing machine and tumble dryer, a beach tote, and an private bathroom with bathrobes, a hairdryer, and free toiletries. Residential-style furnishings create a warm, homey feel in these beachfront rooms, which offer spacious terraces or balconies for unbeatable ocean views. This room is ADA compliant and features a flat-screen TV, a DVD player with a lending library at the Concierge desk, an alarm clock radio, a coffee machine, filtered water, an in-room safe, daily housekeeping service, a washing machine and tumble dryer, a beach tote, and an private bathroom with bathrobes, a hairdryer, and free toiletries. 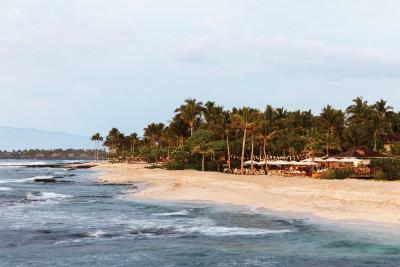 House Rules Four Seasons Resort Hualalai takes special requests – add in the next step! 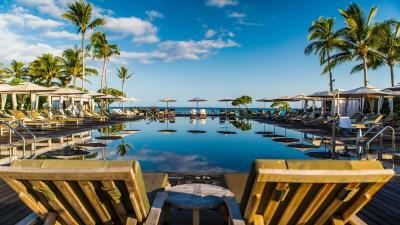 Four Seasons Resort Hualalai accepts these cards and reserves the right to temporarily hold an amount prior to arrival. Food wasn't great. Room wasn't made up till after 3pm each day and the amenities (cotton pads) were not replaced despite requests. The washroom at the Grill weren't clean. Pilates class was cancelled at the last minute with no explanation and after sending us on a goose chase. The food was quite good in most instances, but I expected better preparation from a hotel that has such a strong reputation. Breakfast overpriced. No continental with pastries available 45$ buffet ridiculous. Restaurants were outstanding. Tv was HUUUUGE! The beach is a bit small. The lower level rooms were very musty smelling. We had to change rooms. We have traveled to many Four Seasons around the worl and this one was at least 1 step behind most of the ones We haves stayed at. The buildings seem to need work and the overal experience was low in our opinions. We arrived early and asked for an early check in, and for that they asked us to upgrade our stay to a room that is available now, this costs us 300$ which we paid except that we received the room 30 min before 3:00, which was really not fair. The amenities are those of a 4 star hotel. only one option for breakfast and its crowded and takes away from the exclusiveness of what a Four Seasons property should be. It's not at the same level of other Four Season Resorts. Very hard to book a restaurant, one of them was closed, no activities for family dining (only for 21 and above), climbing wall for kids closed, no attention to details as other Four Season hotels, every night some private group dining (excess of promotions) etc. very frustrating knowing that the ultimate differential of Four Seasons is services. Even after complaints at concierge no feedback from manager on duty as would be expected. I wouldn't recommend for other families.